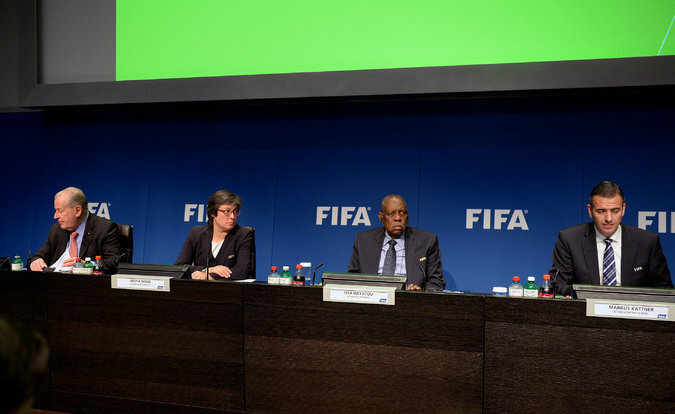 At a news conference Thursday at FIFA headquarters, from left, François Carrard, reform committee chairman, Moya Dodd, vice-president of the Asian Football Confederation, Issa Hayatou, acting president, and Markus Kattner, the acting secretary general. ZURICH — The FIFA officials tried hard. They did. On Thursday afternoon, the acting president and the acting secretary general and the permanent reform committee chief (who just seems to like acting) wanted desperately to talk about change. About progress. About the future.